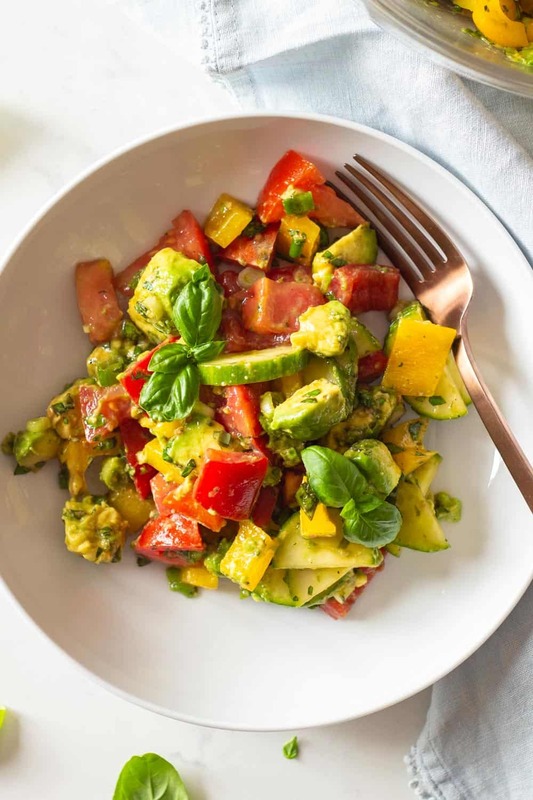 A refreshing Cucumber Tomato Avocado Salad to beat the heat! 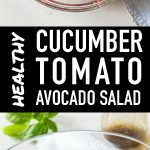 Crunchy cucumber and bell pepper, juicy tomatoes, creamy avocados with a delicious balsamic vinaigrette! Yum! It’s no secret that I’m practically obsessed with avocado salads, haha. Remember the Egg and Avocado Salad? Or the super famous Mexican Quinoa Salad that has loads of avocado and pretty much blew up in the Facebook world? Well, today, why not, I’ve got yet another one for you. 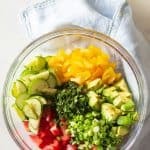 This time I’m mixing my favorite fruit with cucumber and delicious roma tomatoes to keep it fresh and crunchy during the sweaty summer months. It couldn’t be simpler! Just chop up some crunchy English cucumber, juicy roma tomatoes, some bell pepper if you like, add avocado a bit of fresh basil and spring onion and you’re as good as finished. Considering most my avocado salads are seasoned with just lime juice, salt pepper and olive oil I wanted to switch it up a little this time. Balsamic vinegar has a pretty strong taste. I recommend not mixing it with any other strong tastes. Keep your vinaigrette as simple as possible. Just a little olive oil, sea salt and pepper are necessary to round it up. That’s it. It’s no secret that avocado browns pretty fast. My suggestion is to make the salad fresh and enjoy right away. Sometimes however, we just have to or want to prep ahead, right? 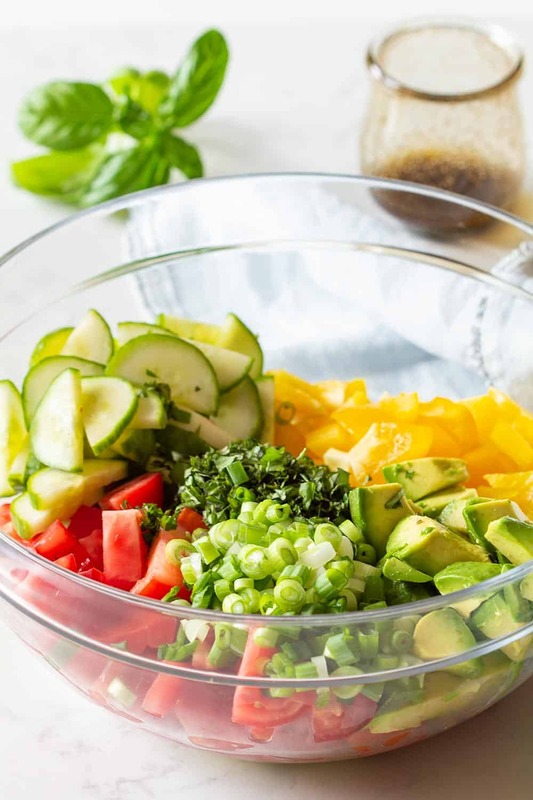 I know you all are fierce meal preppers, so how is the best way to store this salad so it lasts at least until lunch time the same day or next day? It’s easy. 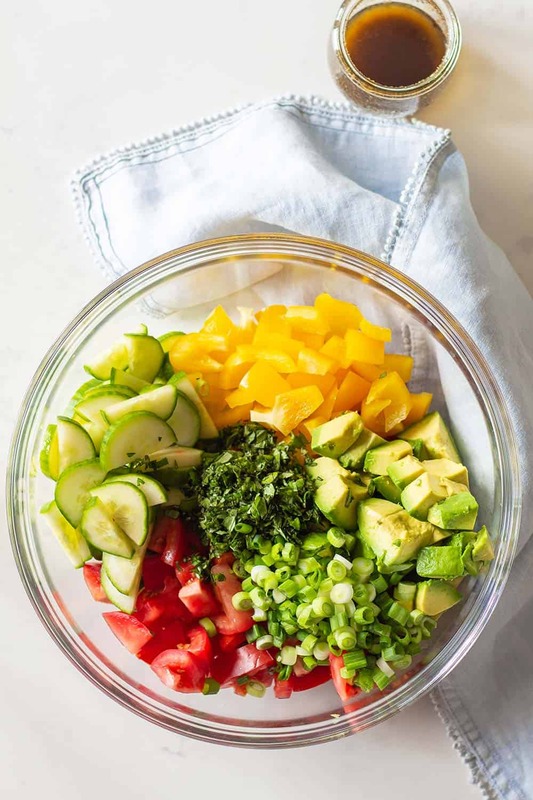 Make sure you have your cucumber, bell pepper and tomatoes, basil and spring onions all chopped up and ready. Then prepare your vinaigrette and add to the bottom of a tall jar. Cube the avocado last and add to the vinaigrette and then mix well. Make sure the avocado cubes are well coated. This will keep the avocado from browning the longest. Add the other ingredients in layers in whatever order and immediately seal air-tight and store in the refrigerator. I’ve made this the night before and had it for lunch the next day it was totally fine. You can’t keep it much longer though. Wash vegetables and cut. Cucumber lengthwise and then into about 1/4" thick half moons, tomatoes into cubes and bell pepper into cubes. Half, pit and peel avocado and add to other vegetables. Wash, spin dry, destem and finely chop basil leaves and add to salad. Wash and thinly slice spring onions and sprinkle on salad. In a small jar mix olive oil, balsamic vinegar, sea salt and pepper and then drizzle over salad. Toss and serve. This is just amazing. I have tried this salad and no wonder I am addicted to its taste. Thank you so much for the recipe!! Yum! I added kalamata olives and cheese chunks for protein. Simple, healthy and oh-so-good! Thank you! I’m so happy you liked it Kyra!! love your recipes, love veggies and salad, like to make them all, thanks for sharing. Is there possibly a way that you could give substitutions for oil you put in your recipes? I am on a no oil plan because of my diabetes. Wouldn’t it be great if you could cut out the 14 grams of fat per serving! Hi Joan, I’m sorry, I’m afraid Green Healthy Cooking is the wrong recipe blog for you. I am everything but a low-fat. I believe in the benefits of a higher calorie, nutrient dense and healthy fat diet.